Our green S7 took off from a hot and humid Beijing. It was full of Russians who had come to China to buy cheap stuff. Surprisingly, I did not see any drunk, rowdy Russians, so I closed my eyes in hope of taking a 5 hour nap before the long drive to the river. In only 20 minutes, I returned to a rude reality. Just behind my seat, a Russian lady with a loud and unpleasant voice began to share with the other ladies around her of her rich experience of traveling to China and buying everything. I think she was a major trade partner with all 1.5 billion Chinese people because she did not stop her stories even for a single minute on the entire flight. She knew where to buy and how much to pay for everything in China – from furniture to toilets. Finally the airplane landed in smoky Novosibirsk airport Tolmachevo, which had not changed at all from the time I was there more than 20 years ago. Under close supervision of police and other stern people in uniform, we were placed in a small room for passport control. My guests and I chose the line behind a middle-eastern looking man. In 10 minutes we realized our mistake as a crowd of Tadjik migrants began to grow in front of us, rather than behind us. We retreated to the other line but soon understood that Russians were also eager to cut the line. Somehow people in Russia think that if you create a crowd instead of an ordered line, then you will reach your goal faster. 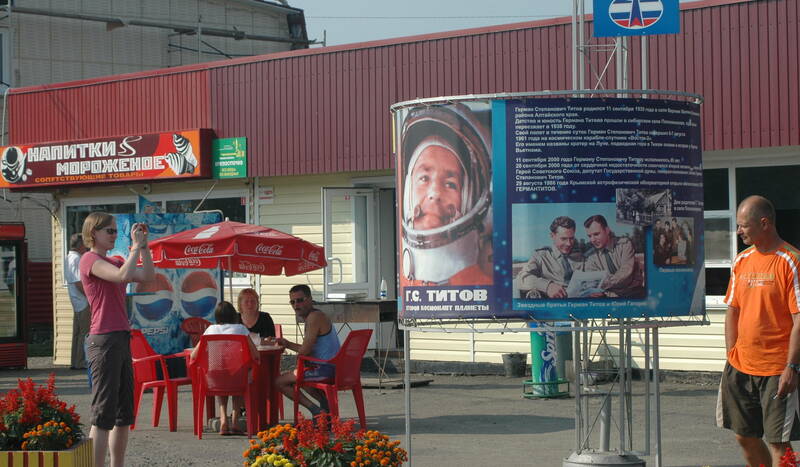 In this area, they have not changed at all from the Soviet time. Eventually we passed the never-smiling Russian border officers, but just outside the building, we were greeted by happy Anatoliy! 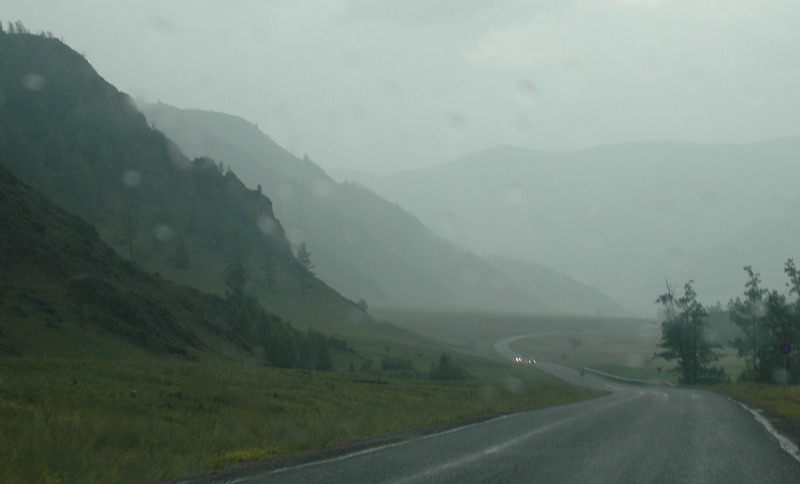 He loaded us and our belongings into his little Honda, and we began our drive to Barnaul. It definitely was not our best day. Even as Anatoliy drove us around the huge city, the traffic was awful. Each intersection was crowded, and exactly like in the airport, Russians cut the line – driving their weird variety of cars (from ancient rusty “Ladas” to shiny brand new BMWs) like crazy. They passed us on two lane road from left and right (driving on shoulder) producing even more of a traffic jam. It took two hours before we finally left the city, and Anatoliy stopped at a small road café where we got a chance to get some food. It became one of the bright moments of the day – the food was delicious and very inexpensive. 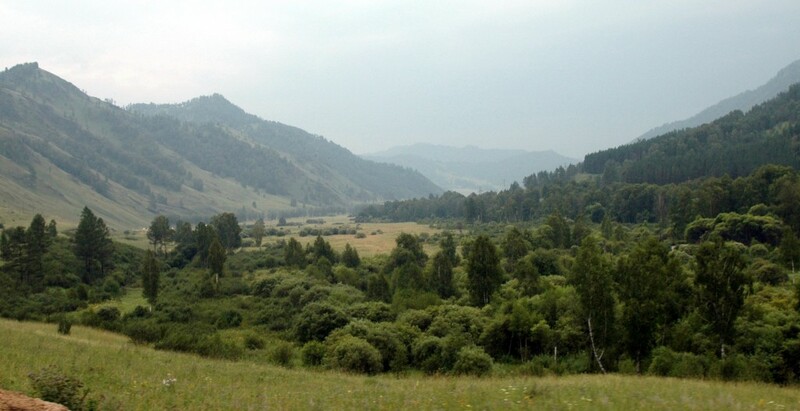 In six hours we arrived at Barnaul – capital of the Altai region. It is a big (about 800,000 people), typical Siberian city – a mix of a nice 19th century architecture and not so nice Soviet-style concrete buildings diluted with a bunch of post-Soviet “excesses”: billboards, shack-like kiosks, etc. The center of the city looked clean and pleasant. We were placed in hotel “Barnaul” – a 9 story building in the center of the city. This pretty-good-in-Russian-standards-hotel was practically empty; we did not see even a single guest but us in the entire building. Nevertheless two stern looking receptionists carefully studied our American passports before sending us to clean rooms on the fifth floor. Considering price-quality ratio it was a great deal. After a well-deserved rest, we found that the price included a very good breakfast, which was a great thing before the long drive to the river. We headed out in a nice Fiat van past numerous wheat fields – Altai is a major grain producing region in Russia. We stopped in a city called Biysk, where two very large rivers, the Biya and the Katun’, meet and form an even larger (actually one of the world’s largest) river Ob’. Here we stopped at a big grocery store (I could not even imagine such a store in Biysk 20 years ago!) where B. proudly paid for purchases himself, without even minor help from me as a translator. Later the road slowly began to climb into the mountains but generally followed the river Katun’. Since 1969 I had driven this road many times. 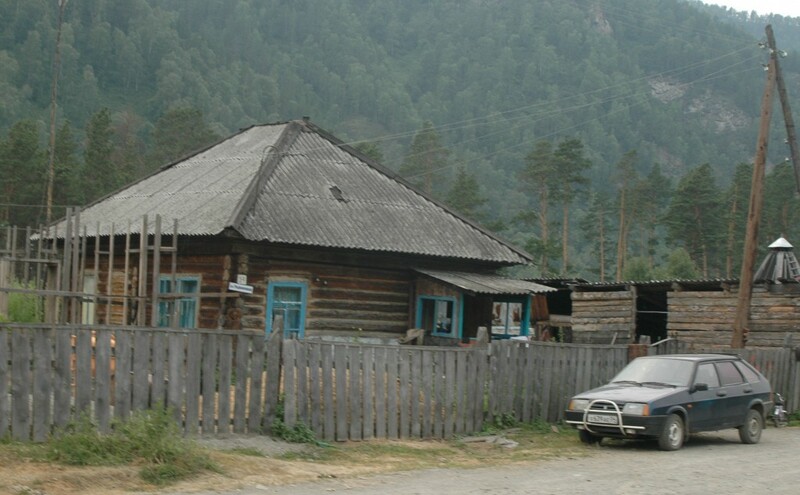 I remember Chuyskiy trakt as a dusty dirt road with only patches of asphalt past the village Manzherok. I remember how herds of sheep and yaks slowly walked along the road and often forced trucks to stop. At these times, trucks were about the only vehicles on the Chuyskiy trakt. I heard many legends and stories about dangerous places on the road. Over more than 200 years, the trail connecting Russia and Mongolia had evolved into a modern highway. Still the highway was dotted with monuments reflecting its history. We passed several villages, which looked like nothing had changed during the last 20-50 years (with the exception of cars now littering the dusty streets). Some of these settlements proudly displayed their heritage on big billboards along the road. We saw native villages of the second Soviet Cosmonaut German Titov (and his museum) and the famous (and really good) Soviet writer and actor Vasiliy Shukshin. Maybe people in these villages still live in sub par conditions, but they definitely have reasons to be proud of their countrymen. There are many tiny restaurants along the road. Some of them are open 24 hours and are always ready to serve tired and hungry drivers. We saw many food stands along the highway also. People sell delicious sweet melons from Uzbekistan, homemade jam, honey, and switches of birch twigs (probably only in Russia), which Russians use to torture (they call it massage) themselves in sauna. We stopped at a farmers market in a big village called Srostki for lunch. Local women offered their homemade food, which is very good and even a bit exotic for Westerners. The mountains grew higher and the highway left the river Katun’ and began to climb to the highest summit on our journey – Seminskiy summit (about 5700 ft). It is a long climb, but the highway is not a dirt road anymore and therefore it did not seem as challenging as many years ago when I visited Altai for the first time. The wall of rain hit us right on the summit. We almost could not see the road. The rest of the way we drove under heavy rain. We crossed the second picturesque summit Chiket-Aman where the winding road cut into cliffs and began to descend to the Katun’ again. Despite the rain, the views were gorgeous. Our van crossed the Katun’ and very soon we entered the wide valley of Chuya. We stopped at a tiny restaurant for dinner, ran under heavy rain to the door and as soon as we entered, the lightning shut down the electricity. A couple Altai ladies inside found a few candles, and we reached for our flashlights. Somehow these ladies fixed a simple (but again delicious) dinner for all of us in almost complete darkness. As we finished our dinner the electricity was turned on. In an hour and a half, we began to build our tents on the green shelf above the rapid “Burevestnik” on Chuya river.